The markets finally went down during February and quickly I might add. To start off the month the major US indexes continued the late January slide dropping over 10% at the lowest points over about a 5 day period. 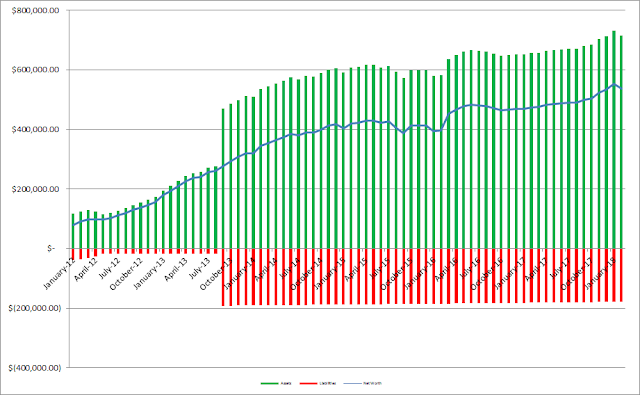 At the end of February the S&P 500 finished at -3.89% so it should come as no surprise that my net worth followed suit. During February my net worth decreased $16,320.87. My 12 month streak of net worth gains finally came to an end with February's decline. However, I'm not concerned with the 2.95% because over the long run the trend will correct itself. Plus, it's not healthy for the markets to move in one direction all the time. Thanks to a nice amount of savings this month, and diversification of our assets, we were able to counter some of the markets' moves with our net worth declining less than the market. 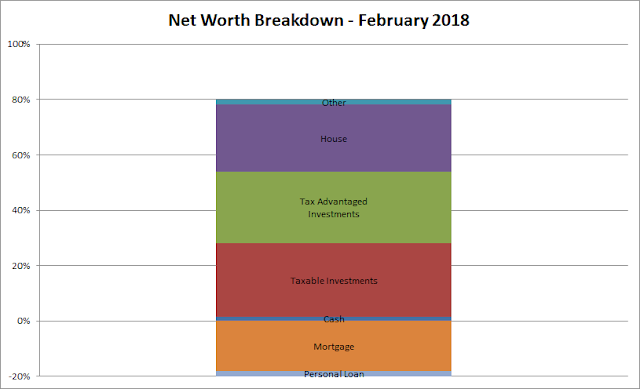 Despite the decline in net worth, I still consider February a win because of how our cash flow panned out. Even after accounting for an extra $800 of expense to fix the fuel pump for my car, I still had net savings of just over $7k for February alone counting all income sources. I'm in cash hoard mode until we get some savings built up and we get our taxes filed, but after that we'll really get to work on our financial targets for 2018: namely paying down debt. At this time I don't see much reason to pay extra on the mortgage given our relatively low interest rate as well as the tax break on mortgage payments and think we'll come out much further ahead investing the extra cash flow. Actually I'm considering trying to do a refi sometime during Q2 or later. So the liabilities side of the net worth equation will be slow moving. However, once the FI portfolio is able to get to a self-sustaining level of dividends then the plan is to aggressively pay down the mortgage. 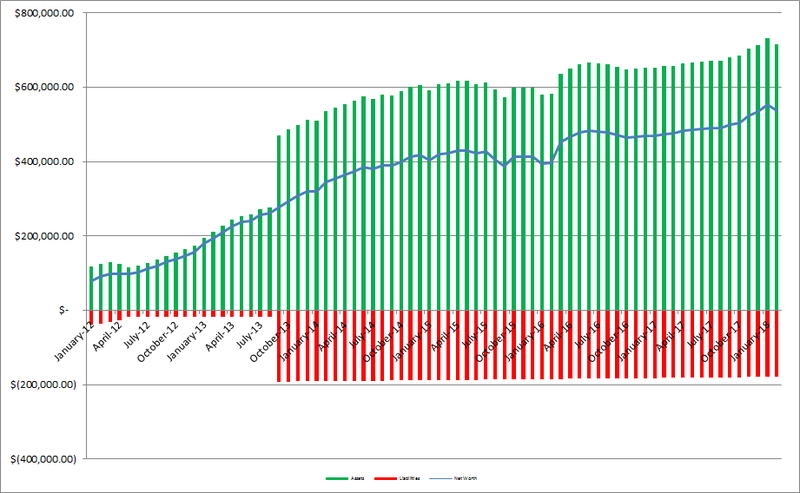 As of the end of February we have 25.9% equity in our house based on our purchase price from 2013. However, according to Zillow our house has increased in value around $37.55k from our purchase price which is a nice bonus, although I keep the purchase price as the value in the net worth equations. Based on Zillow's estimate the equity in our house is 36.8% thanks to the appreciation. 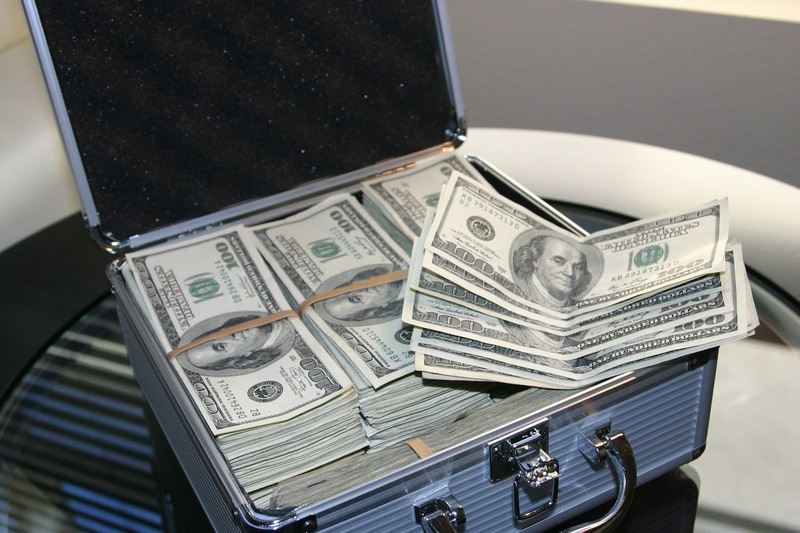 The liabilities are much simpler and fall into either the mortgage or a personal loan that we have. Although I do need to gather more information on the various medical, funeral and other debts that total around $25k to give a more accurate representation of our liabilities. Since I write so much (or at least try to) about investigating companies as an investment I figured it'd be fun to see how our balance sheet looks. As of the end of February our debt to equity ratio is 33% and our debt to total capitalization is 20%. Not bad, but I'd love to get that debt down to ZERO! How did your net worth fare with the market decline? Great net worth regardless of the reduction JC. I haven't checked my own but I am pretty sure it has gone down in last couple of months with the market moods, which is fine, it creates some opportunities for creating new positions at discounted rates. All good streaks come to an end JC, hopefully nothing more than a little blip on the march upwards. My models predict that this is just a correction and not the start of a bear market. So no need to panic, and this correction is meant to be bought. Good review. I always like reading these updates in part because I’m considering whether I should blog about my own net worth. You had a nice streak going and as long as there is not another streak in the reverse, little bumps along the way like in February are ok and to be expected.